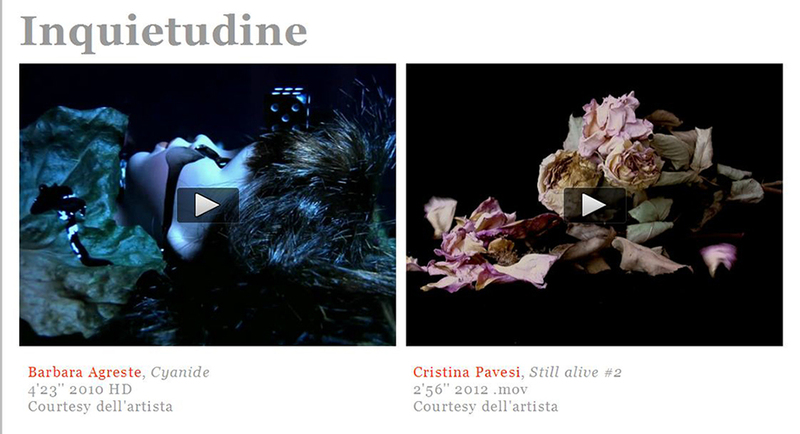 This week we will have on show 2video Inquietudine hosted on the undo.net online magazine, and curatorial platform. 2video is a weekly exhibition that presents two video art pieces put together by video artists from all around the world. This week we are featuring “Cyanide” by Barbara Agreste and “Still Alive” by Cristina Pavesi. 2Video is a project that each week selects two new videos by those artists who have uploaded their work to the Art Hub archive (http://www.undo.net ). All the videos have been carefully chosen to be shown side by side, on the claim that may resemble each other or present similarities in their concepts, messages or images. They may share a word in their title, or they may contain something alike in their dialogues, or again share colours, shapes, atmospheres and sounds. Therefore while watching these two moving screens played simultaneously the viewer notices that the presence of those similarities can produce a shift to the meaning of these works. On the web page hosting them there are two video players and the viewer can play or stop the videos as they like, viewing them either together or separately. Barbara Agreste and Cristina Pavesi this week have granted us with two examples of how video art can express a sense of uneasiness, cold, silence, and loss. And yet a constant wind howling in the dark is also deafening, moving away petals, or travelling over fragments of mirrors met as the viewer/author moves across a dark path. The colours are very strong and there is a high contrast in Barbara Agreste’s imagery, while Cristina Pavesi offers a delicate, pastel like yet vivid palette. This event has been online since 2007, and it is open to contributions from many curators.